Долгожданный запуск "Чемпионата по Переводному Дураку" - для всехкому уже понравился "Чемпионат по Подкидному". Пройдите турнирнуюкарьеру в самой популярной русской карточной игре по городамРоссии: Воронеж, Краснодар, Екатеринбург, Ростов, Петербург и др.Выиграйте кубки всех городов и станьте Чемпионом! В игре вас ждет:* Тысячи реальных игроков онлайн. * 2 режима игры - Простая игра иТурниры. * Сезонное соревнование (турнирный Чемпионат, длящийся 3месяца). * Лиги игроков (недельное соревнование в небольшой группеигроков со схожим уровнем). * Множество бесплатных бонусов - в игрудействительно можно играть бесплатно. * Удобная система общения(быстрые фразы, смайлы). Игра постоянно развивается, и впереди васждет много интересных нововведений! The long-awaited launch of the"Championship Transferable fool" - for everyone who has liked"Championship Snap". Go tournament career in the most popularRussian card game of Russian cities. Voronezh, Krasnodar,Yekaterinburg, Rostov, St. Petersburg, etc. Win the cups all thecities and become a champion! 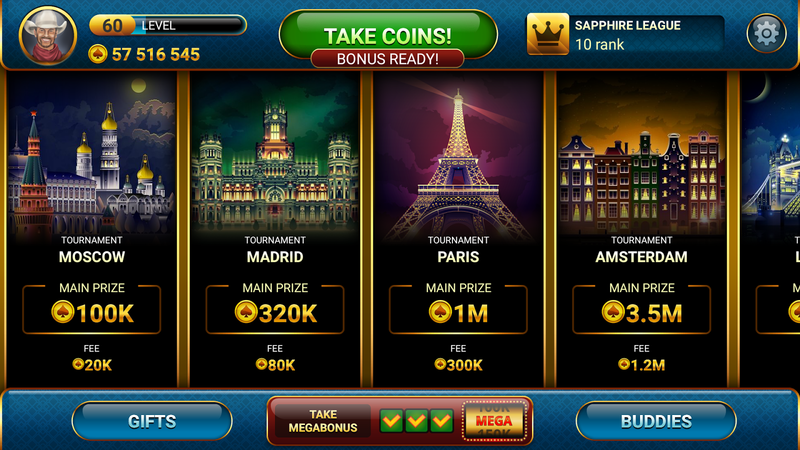 In the game you will find: *Thousands of real players online. * 2 game modes - Easy game andTournaments. * Competition season (the championship, lasting 3months). * Players League (competition week in a small group ofplayers with a similar level). * Lots of free bonuses - the game isreally possible to play for free. * Easy communication system(rapid phrases, emoticons). The game is constantly evolving, and infront of you waiting for a lot of interesting innovations! Play Nardy online and pass championship across ex-USSR capitals:Baku, Erevan, Tbilisi, Astana, Minsk. Win Cups of all the citiesand become a champion! Nardy Championship is differ from"backgammon" game. It is famous in Russia as "Dlinnye Nardy" In thegame you will find: * Thousands of real players online. * Dinamictournaments with different prizes. * Seasonal race (Championshiptournament, which lasts 3 months). * Players League (weeklycompetition in a small group of players with a similar level). *Lots of free bonuses - the game can actually be played for free. *Easy communication system (prepared phrases, emoticons). *Exclusive tournaments to mark the holidays and other significantevents. The game is constantly progressing, and in front you willfind a lot of interesting innovations!